In this research we set out to understand why people choose to trade in redistribution markets. We define a redistribution market as a market where people swap good-for-good, and no cash exchanges take place. Economic theory predicts that individuals would be reluctant to trade dissimilar items (e.g. a book for a cd player). Given that trades of this sort take place in venues like swap.com and bookings.com; online sites where people trade hundreds of items per day, we sought to find a theory that would explain this behavior. Our hypothesis is that the way individuals value their goods (inferred value of their goods) is contingent on environmental cues and the consumption context. Specifically, that being in the site of others (known as public consumption) would attenuate the necessity for similarity in products. In simple terms, swapping is more likely to take place in a public domain than a private one (Under the view of others, versus private). 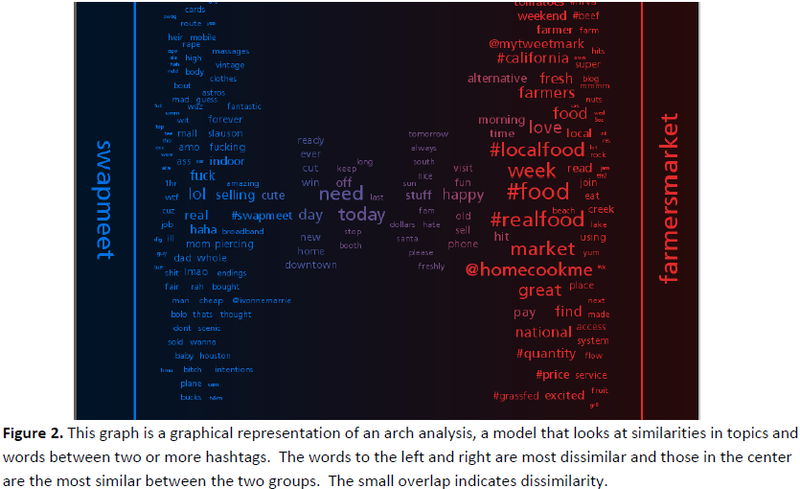 For this research we performed a set of data mining and extracting from Twitter, an online micro-blogging website. Twitter operates as a message board for users to post comments on a wide variety of subjects. One feature special to Twitter is the ability to tag posts using a hashtag. A hashtag is the pound symbol followed by a word. For example the hashtash #swap may be included in a message that someone using Twitter may want to post about a Swap that they completed. 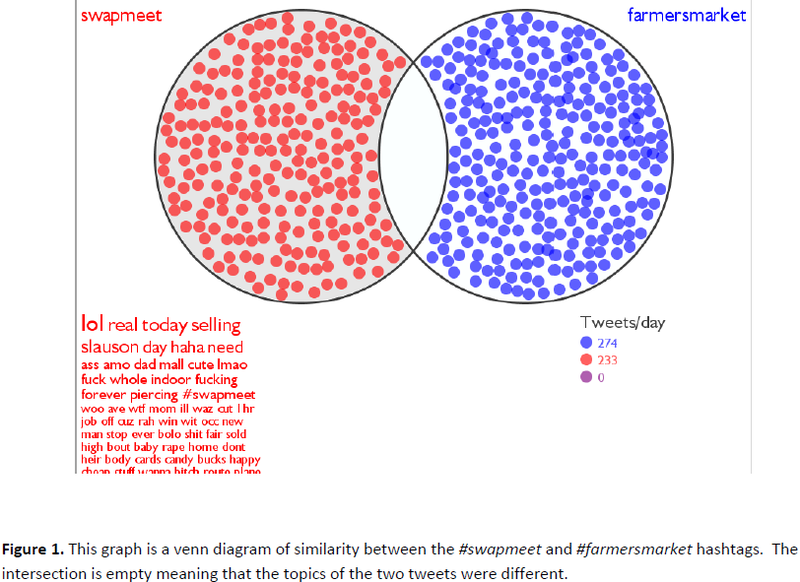 We exploit this feature of Twitter to capture tweets containing two hashtags namely: #swapmeet and #farmersmarket. 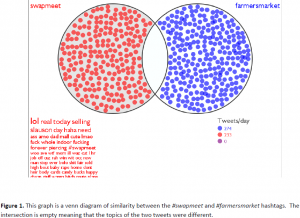 We chose these hashtags because one is more of a typical market where goods are exchanges for food (the farmers market) and the other is a market that is half of what swapping as defined earlier is, and half a traditional market. 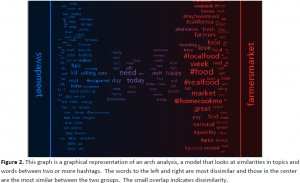 We will look for differences in sentiment between the two groups using Natural Language Processing statistical algorithms. These results support our hypothesis that public consumption can attenuate the necessity for similar in trades. However, this finding preliminary. In order to establish a casual link, we need to perform an experiment. We have collected a larger set of data on the #swap hashtag which deals directly with the swapping we look to investigate. We are performing Latent Dirichlet Allocation (LDA, a statistical probabilistic topic model) on this data. We are also planning a field study, in order to investigate the effect of public consusmption on swapping behavior.